National Day- Ngay Quoc Khanh – is a national holiday in Vietnam observed on 2 September, commemorating President Ho Chi Minh reading the Declaration of Independence of Vietnam at Ba Đình Square in Hanoi on 2 September, 1945. Emperor Bao Dai, the last of the Nguyen Emperors had abdicated a week earlier, 25 August. 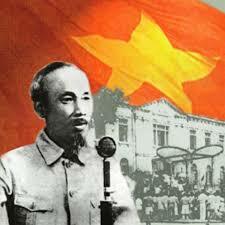 With the end of the World War II the Japanese were gone and the Viet Minh, led by Ho Chi Minh, grasped the opportunity to declare an independent Vietnam. France came back to reclaim its former colony, however, and a war for independence known as the First Indochina War broke out in 1946. In October 1954 the French finally gave way and Vietnam became truly independent from France.